Last day of riding… you’d think the wind gods would acquiesce and give me a token tailwind, since I’m riding south. Not to be. We had a full-on breakfast of French toast, granola, fruit, juices… Kathy is great. We said our farewells to Jack (forgot to get a photo) and I rode west to Everett, the boys in my mirror, heading towards Redmond. It felt odd and sorta calming to be riding on my own, but I could have used extra eyes and Google to help me navigate. The dopey Garmin kept routing me off of the Interurban trail, a 15 plus railroad grade trail connected by some detours on city streets from basically Everett to Seattle. 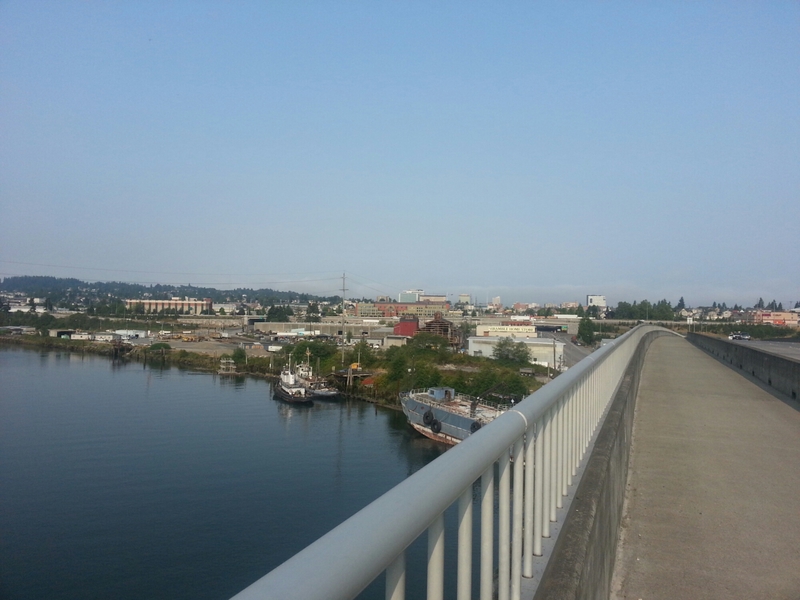 The view from a bridge leading to Everett. I rolled into Seattle around 12:30, stopped at a market for lunch and food to bring on the train. Then on to the station to make sure I was set. My ticket was ready, next challenge, packing up the bike in a box. The agent said he could only offer new boxes at $15. I said I’d get back to him, walked outside and down the alley to the dumpster where there were a half dozen discarded boxes, score one for dumpster diving. First problem, getting the pedals off. My tool didn’t have enough leverage. I got back on the bike, asked people on the street, asked an officer and finally asked a bike hipster with a messenger bag for the nearest bike shop or hardware store. Bingo. He told me how he was starting as a bike messenger tomorrow, and had just been delivering weed up to now. Less pay, but a real job in the big leagues. He led me in true bike messenger riding style, to Back Alley Bike Repair. Truth in naming. The mechanic brought out the heavy duty Park Tool pedal wrench and loosened my pedals, thanks! Back to the terminal, twist the handlebars, roll the bike in the box… too long! Ugh, here we go again, danged Frankenbike. I pulled the front wheel off, counter to the instructions and taped up the box. Back in business. $10 baggage fee and checked. I spent the remaining time wandering around the nearby blocks looking for more snacks and reading material for the ride. Not much success. I returned to the terminal, talked to a few other riders, got in line and boarded. The train rolled out on time, that may be the only part of the journey that will be on time. We followed the Sound (second largest estuary in the US behind Chesapeake Bay. As we rolled past a seashore beach, there were two naked guys standing in the water, at least they faced away when the train went by. Not in the Amtrak brochure. 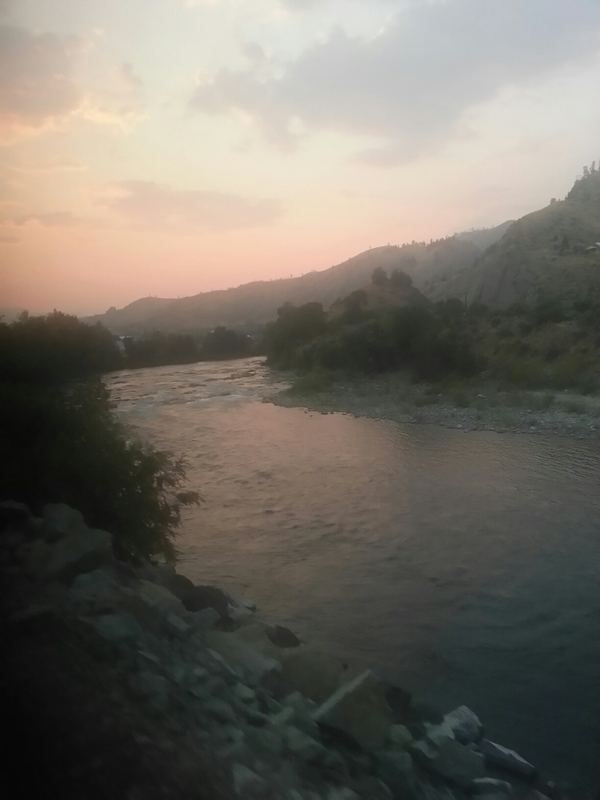 The ride through the Cascades was beautiful and the sun is setting. Tomorrow, I’ll summarize my thoughts about the trip, share what worked, what didn’t, what I wish I had brought, what I wish I left behind. And, my thoughts on doing something like this again.